To compile their new Register of People with Significant Control, a company must follow a process to identify its PSCs. In this article, we look at what makes someone a PSC and, having identified a person as a PSC, what information about them needs to be entered in the PSC register. They have the right to exercise or actually exercise significant influence or control over a trust or a firm that is not a legal entity which itself satisfies any of the first four conditions. In Example 1, Company A has two shareholders, each holding 50% of the shares. Because they each hold more than 25% of the company’s shares, both Individual 1 and Individual 2 will be entered on the PSC Register. Assuming all the shares carry one vote, they will also both be noted in the register as holding more than 25% of the company’s voting rights. Unless there is someone else who has special rights to appoint or remove a majority of the board, or exerts “significant influence or control”, Individuals 1 and 2 will be the company’s only PSCs. 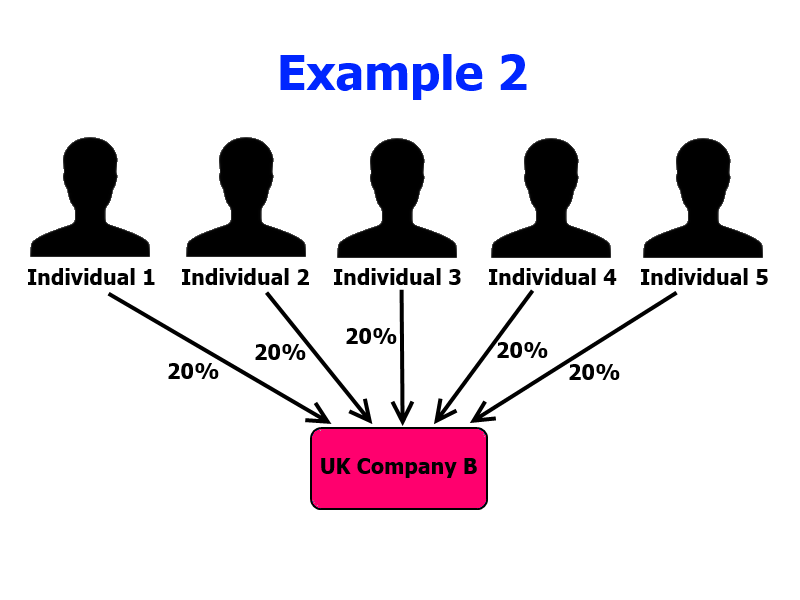 In Example 2, Company B has five shareholders, each with 20% of the company’s shares. Because no single shareholder holds more than 25% of the shares (or voting rights), none of these individuals will be entered on the PSC register. Assuming there’s no one else who meets any of the conditions, Company B doesn’t have any PSCs. That’s perfectly acceptable, but the fact there are no PSCs must itself be entered on the PSC register. The PSC register can never be blank. An individual can meet several of the conditions – e.g. shareholding and voting rights – directly or indirectly. Examples 3 and 4 cover indirect ownership scenarios, where shares and voting rights are held indirectly via a ownership chain. Usually, where a corporate entity holds shares in a UK company and, if they had been an individual would meet one or more of the control reasons, that company would be classed as a relevant legal entity and appear on the PSC register. So UK Company D will appear on the PSC register of UK Company C as it holds 50% of the shares and voting rights. Because Company D is already listed on the register, neither Individual 1 nor Individual 2 appear on Company C’s PSC register. However, it’s different where a controlling company is not a relevant legal entity – for example, it’s based in Barbados. So, because it’s not classed as a relevant legal entity, Non-UK Legal Entity 1 cannot appear on Company C’s PSC register. Instead, we have to look back and see if anyone has a majority stake in Non-UK Legal Entity 1. In this case, Individual 3 has a majority stake because he controls more than 50% of the voting rights. Therefore, it’s Individual 3 who must appear in Company C’s PSC register, alongside UK Company D.
Example 4 illustrates another oddity of indirect ownership. If Individual 1 only held shares directly in UK Company E, they wouldn’t need to be on its PSC register (because the holding is not more than 25%). If they only held an interest indirectly via UK Company F, it would only be F rather than also Individual 1 who would appear on E’s PSC register. But because they hold shares both directly and as an indirect holding via a majority stake in F, Companies House require that Individual 1 is shown on the PSC Register of UK Company E.
UK Company F would also appear on E’s PSC register. A joint shareholding is not counted singly for the purposes of the PSC register. Instead, every joint shareholder is treated as if they each hold the total number of shares or rights that are held jointly. In Example 5, because the joint shareholding exceeds 25% of the shares and voting rights, each of the joint shareholders A, B, C and D who hold the shares jointly must appear on UK Company G’s PSC register (alongside Individuals 1 and 2). That’s despite the fact that, unlike the individual shareholders, they share the rights between them. While it’s counter-intuitive for the Company G’s PSC register to show 6 individuals each holding more than 25% of the shares and voting rights, that’s what the legislation requires. What information about an individual PSC goes in the register? These examples are all well and good, but what about Directors in RTM companies ? They usually exercise direct influence over a Company.